Receving a letter from the Department of Health would normally send a paralysing wave of panic through most health-obsessed hypochondriacs such as myself. On this occasion, however, as I mentioned in ‘A Letter From No. 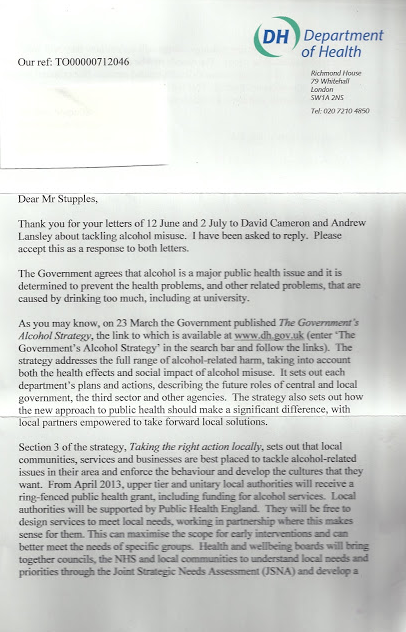 10 Downing Street’, I was in fact expecting a reply from Health Secretary Andrew Lansley or (more likely) from one of his advisors regarding my article on students’ binge-drinking: ‘Why Do Students Love Booze’. I was encouraged to discover that the matter, as you can discover yourself from reading the letter, is ostensibly an issue with which the central and local governments are attempting to address. I will continue to keep a watchful eye, though, over both governments’ actions over the matter of alcohol abuse: I still suspect it is far more severe than anyone in either our local or central governments could ever have imagined. So far, also, I have found no evidence to suggest they are taking action locally.